Your dorm room decorations can involve more than just dorm posters on your dorm wall. You want your college dorm room to look unique and feel like a home away from home, and you want to change up the look of your dorm room decor with a variety of dorm essentials. 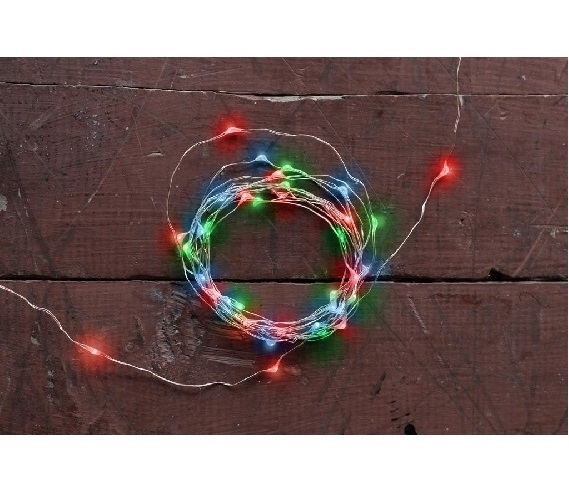 To create a unique look in your dorm room decor, add our Red, Blue, and Green Battery Lights - Copper Wire to your dorm essentials. This delicate strand of dorm lights will brighten up your college dorm room decor and help you create the unique style you want. Our Red, Blue, and Green Battery Lights - Copper Wire feature 20 miniature LED lights in red, blue, and green on a copper wire strand for a high impact look that will allow you a lot of versatility. The copper wire strand also has a flexible nature that will allow you to mold it around dorm items and create a unique dorm wall art design on your college wall. These dorm essentials are even battery powered, which allow you to have ultimate versatility in your design. You won't have to be limited to where the electrical outlets are in the college dorm room, plus you'll have an extra outlet for dorm essentials like you cell phone or computer charger.